Classy! She claims that white stuff is "flour." Yes, sweetie, and those are your real "lips." And "labia." For some reason, I'm endlessly fascinated with this trainwreck. Her freakiness lifts me up when I feel blue, like a two-headed puppy or an adorable lobster-clawed baby. 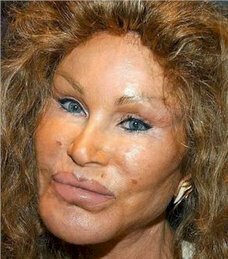 She's more than a little Pete Burns' not-so-distant cousin. Minus the talent and charm, obvs.